– Having been taken into heaven both spiritually and bodily, the Virgin Mary helps believers to grow in “Christian hope” during their earthly lives. The Pope can not managed without the “Catholic Queen of Heaven”. She is his mother, regardless of that the Bible says about this blasphemy. These are the words used by the Pope, in his speech of 15th of August during the “Feast of the Assumption”. Dogmatically defined in 1950, the assumption of the Virgin Mary’s body and soul into heaven is a perennial part of the Church’s faith, Pope Benedict told pilgrims who joined him to pray the Angelus at his summer residence later in the day. He explained that Christ’s mother, who was “redeemed from the first moment of her life,” is “associated in a special way” with the mystery of Christ’s own life, death, resurrection, and ascension into heaven. Since not a single word of the Bible explain that Miriam the Mother of Jesus was going to be rapture into Heaven. The Pope is presenting us with a non scriptural dogma. Or what rather should brand pure fiction. If we go beyond what is written, than anything might get permissible. With such disrespect for the written word of God, we end up with lawlessness. “god” might even have a grand mother, and so on. The Pope fits perfectly into the prophecy from Paul, abut the man of lawlessness. What is at stake her? The Pope wants “his” “god” and the Catholic godmother to be equal. In fact they are. But non of them are divine, but pure fiction. If we claim “Catholic Mary” to be equaled to God the Son, we promote idolatry as “holiness”. Jesus is eternal God. He is not created. The eternal God came in flesh, put on flesh by being born by a Jewish virgin. She is the mother of Jesus. Not at all free from sin. Not at all the ‘Mother of God”. 1. Only Jesus was born without sin. Not his mother. The Pope is a liar. 2. God do not have a mother. God is not birthed, nor created. God is eternal. The Pope is a liar. 3. There is absolutely nothing in the Prophetic Words given to us by Jesus, that explains that His mother would ascend into heaven in body and spirit. The Pope is a liar, who place Him self above God of the Bible, and says things unheard off. 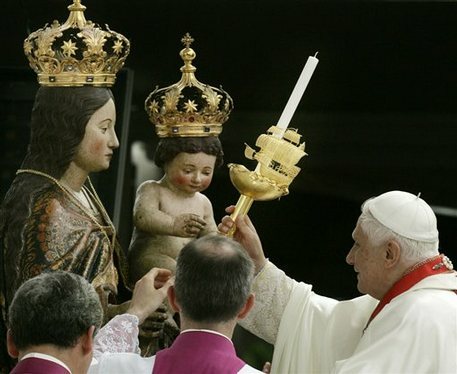 In particular the claims about the “Queen of Heaven” made the Pope fit perfect into a seat of an antichrist. This is best explained by the Jewish prophet Daniel. [ The King Who Exalts Himself ] “The king will do as he pleases. He will exalt and magnify himself above every god and will say unheard-of things against the God of gods. He will be successful until the time of wrath is completed, for what has been determined must take place. The Roman Catholic religion is not even a man made religion. It is a carefully demonic invention, that leads us into mockery of the true Biblical faith in Jesus the Messiah. So many will find out that they have been supporting ‘devils’ …a lot of Christianity today will eagerly and easily say that Catholics are Christians…knowing it’s a lie but afraid to say so. The Virgin Mary, was sinless at her own Birth. Her mother was Infertile! This makes her a Diety, equal to Christ! VERY SAD, the RC Faithful….The Catholic Mary plays NO ROLE in SALVATION and she is NOT SINLESS…ONLY Our LORD CHRIST JESUS is SINLESS because He Is GOD! People say the Repetatve Hail Mary, which is like the Heathen…What can I say! Yes, you are right. The Catholic mother of Christ, is not the Messiah of the Bible. All the Church reformers in the 16th centrury called the Pope an antichrist. Because the Pope claims to be the Vicar of a copy of the Messiah, and being his supreme representative on Earth. The gross errors of the papacy are many. On of them is the heretic dogma of the sinless mother of “Christ”. Only the true Messiah was born free of sin, never sined, and was taken up in Heaven sinless, in body and soul. Both the theology, and the very foundation of the Roman Catholic Church is based on fraud.